Here we are…Christmas Day and the Retailers’ 12 days of Christmas are finally over so now we can celebrate the true twelve days of Christmas! I began my “Twelve Days of a Green Christmas” in 2011 as a fun way to share ideas of being more conscious of your carbon footprint, the food you eat and the gifts you buy. I have learned a lot along the way by researching the 12 “gifts” that I need to “fit” into the verses of the song. So if you are ready to join me this year just recall the tune and sing along! Contrary to what Retailers want you to believe the twelve days of Christmas begins on Christmas Day (the 25th) and ends on the fifth of January followed by the Feast of the Epiphany on January 6, according to Wikipedia. Every country has traditions for celebrating the Epiphany. Here in the US, you have probably heard about preparing “Kings’ Cakes” leading up to Mardi Gras in New Orleans, the “Great Fruitcake Toss” in Manitou Springs, Colorado and the elaborate celebration with the tossing of the wooden cross into the Spring Bayou in Tarpon Springs, Florida, all of these beginning or on January 6, the day after the twelfth day of Christmas. What a history lesson, especially on Christmas Day! Although retailers would like you to believe fake trees are one of the greenest options for a Christmas tree because a single tree on a super-huge cargo ship coming from China will have a lower carbon footprint than commercial trucks driving down our highways delivering goods. However the fact still remains that fake trees are made from PVC materials and will never decompose! Buying a fake tree is not an option in my mind! The next choice would be a live tree. When deciding on a live tree you have a choice between a live, cut tree or a live, planted tree. For the past 3 years I have advocated a live, planted tree but honestly my yard is not large enough to handle another live planted fir or pine tree so I had to move on to the thought of a live, cut tree. Could my choice be good for the environment? According to the National Christmas Tree Association an acre of farmed Christmas trees provides enough oxygen for 18 people to breathe. The Association estimates over 350,000 acres of farmed trees in the US with Oregon being the largest producer and North Carolina number two so you do the math. Additionally Christmas tree farms provide wildlife habitat and prevent topsoil erosion. Top these benefits off with purchasing a live-cut tree from a local charity and you help your community. For many local charities Christmas tree sales are one of their biggest fund-raising efforts of the year. Not a bad choice by any means with several benefits. But what if you are a real “eco-purist”? 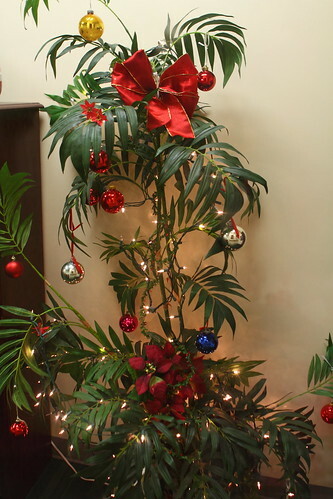 You may have decided the greenest Christmas tree is not even a traditional “Christmas” tree. Why not change the shape and kind of tree in your mind and decorate an existing tree in your yard or a potted house plant? One of my favorite Christmas trees was a palm tree that found a home in my backyard after Christmas and still provides memories of a most enjoyable holiday! Another favorite was the potted rosemary bush shaped like a Christmas tree which provided me months of one of my favorite herbs for cooking. So ends the first verse of the “Twelve Days of a Green Christmas”. I hope you learned something new today and plan to join me tomorrow for the second day of the 12 days.